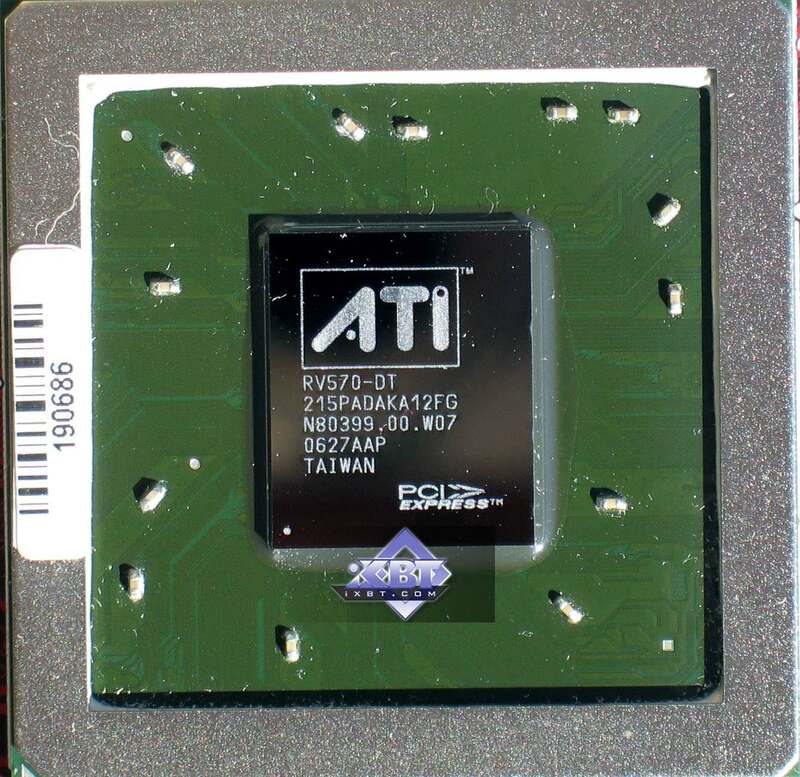 Due to the fact that recently ATI had time to change its release schedule several times we had to cut down our ready article. The result of this you are reading now. We had to curtail the detailed information on X1650 XT as well as its detailed test results compared to rivalling cards. Naturally the article was reduced to a single-card review, but all the curtailed information will not be lost and we'll publish it as soon as possible. Now there are two new entries in the table above: RADEON X1650 XT and RADEON X1950 PRO. Both feature new-generation GPUs made using 0.08 µm process technology. We'll provide the technical specifications later. RV560/570 GPUs were long expected in the market, but their release was repeatedly delayed. 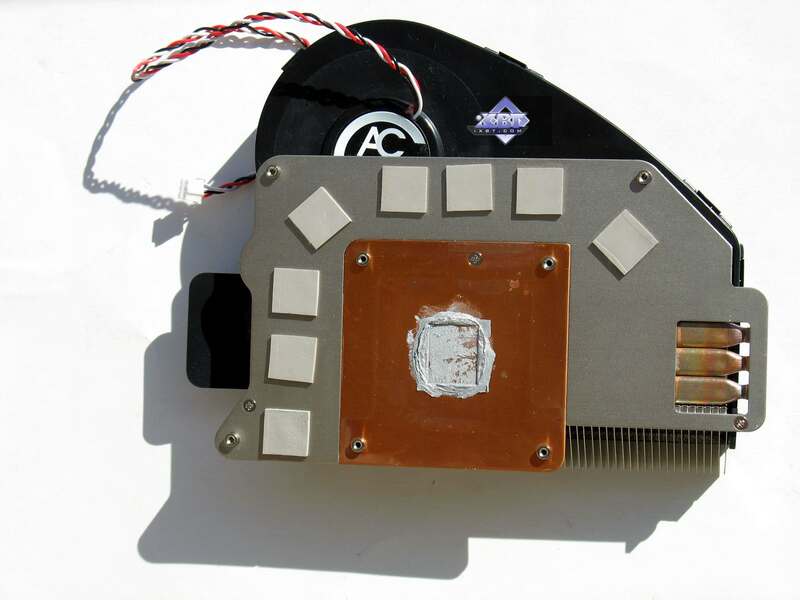 Perhaps, due the reason was the 0.08 µm process technology that was new to ATI and NVIDIA. But there were other reasons as well. 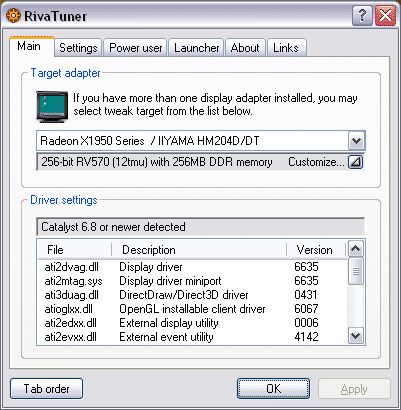 The features of RV570 are close to those of already selling RADEON X1900 GT, which, in turn, is a paired-down R580. 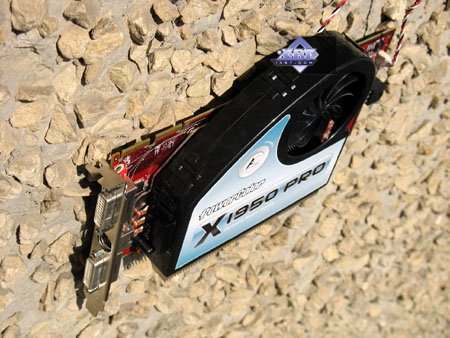 It would be logical to assume that Canadian vendor accumulated enough rejects of this GPU that it had to sell somehow. And this has been done with X1900 GT. In the same way they did with X1800 GTO - to get rid of R520 stock after pairing it down. But if, in case with R520, they sometimes were locking pipelines and ALUs on fully-fledged chips as well (to sell them at any cost), in case of R580 they, most likely, used GPUs with defects that didn't prevent normal operation in the paired-down state. This was the reason of 36 pixel shader units instead of 48; 12 texture units instead of 16; 12 ROPS instead of 16. Vertex pipelines were not touched as well as 256-bit bus. PCB also generally remained the same. They just were installing lower-capacity memory chips totalling 256MB and changed the cooling to that of X1800 XL. The latter was rather questionable, because at 575 MHz even a paired-down core was very hot and that weak cooler was not able to cool it down adequately without increasing fan rotation speed and, therefore, noise. 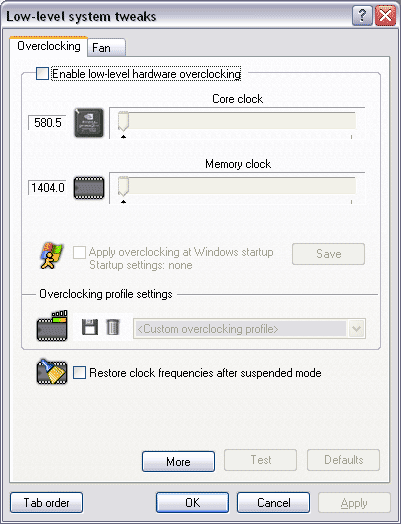 I think that was the reason why ATI decided to abruptly reduce core and increase memory clock rate. I personally was indignant about that totally inadequate decision, because one day the vendor claims that modern applications require still more and more GPU power, so they are increasing pixel shader unit amount. And the next day they easily underclock X1900 GT by almost 70 MHz, promising that increased memory clock rates will compensate. They contradict themselves, saying things favourable at that very moment and changing aims so easily. I personally believe that any significant clock rate change is a reason to change card's name as well. You can't have the 575/1200 MHz and 512/1320 MHz cards named the same. But that's completely on their conscience. Besides, X1900 GT is leaving the market anyway, making room for a more up-to-date and cheaper solution. Indeed, let's remember, for instance, GeForce 6800 on a paired-down NV40. It cost so dearly! So, while moving to PCI-E, NVIDIA decided to not pair down very expensive NV45 GPUs, but released cheaper NV41/42 with fewer pipelines. Same here: paired-down R580 is being replaced by RV570. Yes, it has the same 36 pixel unit, 12 texture units, etc. Everything's the same. But the chip itself has smaller footprint and is generally cheaper. Clock rate is nearly the same 580 MHz vs. 575 MHz. Just the memory clock rate was raised from 1200 MHz to 1400 MHz. The 1.4 ns memory is widely available now, so why not use it as well. Add to this a simpler PCB and you get a $199 solution that can please everyone. At the same time its core supports all innovations and DX9 technologies. The new card features new interfaces for CrossFire cables (read further in the review). By the way, the GPU itself now supports CrossFire without any add-in cards and chips. It's one of the innovations. Dimensions: 210x100x32 mm (32mm is card's max. thickness). Outputs: 2 x DVI (Dual-Link), TV Out. 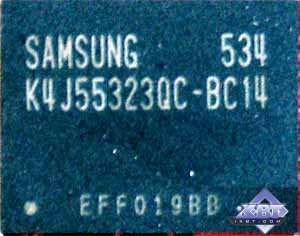 256MB GDDR3 SDRAM in 8 Samsung's memory chips on PCB face side. Obvieusly the PCB is unique although based on an earlier design. 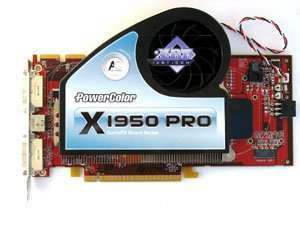 It generally resembles the board of a more expensive and complex X1900 series card, but is significantly simpler. Memory chips are rotated 90° though they are still aligned in a semicircle. Considering a 256-bit bus and high chip clock rate, this is clear - you need to maintain identical (or nearly identical) distance from the core to each memory chip. The RAGE Theater unit providing VIVO functionality is on its usual place. It features TV-in requiring a special adapter. But the external power interface was moved to the center in card's "tail". The power supply unit was also simplified and now has fewer analog elements. It became more "digital" so to say. Overclockers might like that. Each card has a TV Out with a unique interface. So for both S-Video and RCA output one needs a special adapter supplied with the bundle. More information on TV Out is provided here. Speaking of MPEG2 (DVD-Video) playback capabilities, we examined this as far back as in 2002, and little had changed since. Depending on the movie, CPU load doesn't exceed 25% on all modern graphics cards. Let's pause on the CrossFire connection. Finally, you can buy two identical cards and install them like NVIDIA's SLI. From the very beginning we were saying that [hard-to-buy] master cards won't justify hopes and will only degrade multi-GPU operation. It happened exactly so. Judging by Steam statistics, 99% of dual-card systems belong to SLI and only 1% to CrossFire. We can see that card design provides for either two usual adapters or one wide dual adapter. Why so many pins? SLI does with a considerable fewer amount. The matter is that SLI can transmit signals only one way at a time, while the new CrossFire is able to send them both way simultaneously. Besides, adapters are actually flexible cables, so distance between cards doesn't matter. And SLI uses rigid adapters of fixed length (altough they are always shipped with motherboards and therefore are suitable to connect two PCI-E x16 slots). Now about the cooling system. 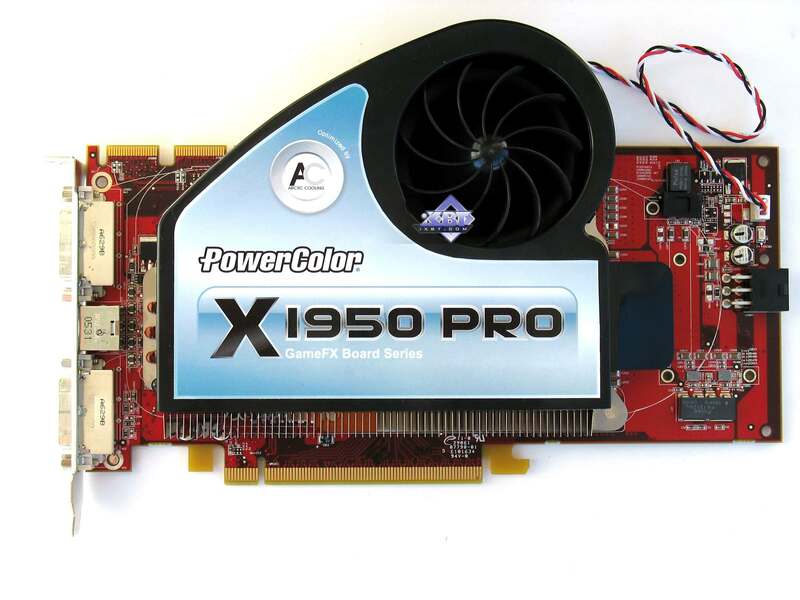 When I was writing this article, I didn't have reference samples in my possession, so I couldn't describe reference coolers bound to be on the majority of such cards. 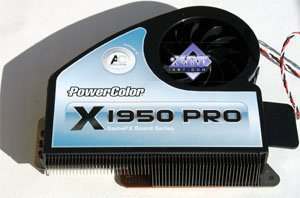 But PowerColor equipped its products with something special. You can clearly see that X1950 PRO features a solution from famous Arctic Coooling, which is both very effective and noiseless. Since we detached the cooler, let's have a look at the core. Considering we have a sample, no sense in speaking of bundle and package. Mitsubishi Diamond Pro 2070sb (21"). 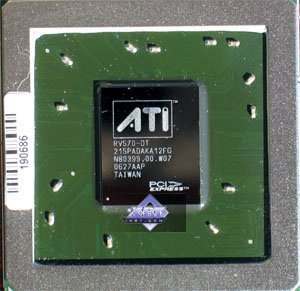 ATI CATALYST 6.9; NVIDIA 91.47. Splinter Cell Chaos Theory v.1.04 (Ubisoft) - DirectX 9.0, multitexturing, maximum settings, shaders 3.0 (for NVIDIA cards) / shaders 2.0 (for ATI cards); HDR OFF! Half-Life2 (Valve/Sierra) - DirectX 9.0, demo (ixbt01, max. quality, -dxlevel 90 option. removed card presets from dxsupport.cfg. FarCry 1.33 (Crytek/UbiSoft), DirectX 9.0, multitexturing, 3 demo from Research (run with -DEVMODE), Very High settings. DOOM III (id Software/Activision) - OpenGL, multitexturing, High Quality (ANIS8x), demo ixbt1 (33MB!). Here's example with automatic execution with precaching: d3auto.rar. (DON'T panic when the screen goes black for 5-10 seconds after the first menu. The demo will follow). 3DMark06 1.02 (FutureMark) - DirectX 9.0, multitexturing, trilinear filtering. The Chronicles Of Riddick: Escape From Butcher Bay 1.10 (Starbreeze/Vivendi) - OpenGL, multitexturing, max. texture quality, Shader 2.0, demo 44. F.E.A.R. v.1.02 (Multiplayer) (Monolith/Sierra) - DirectX 9.0, multitexturing, maximum settings, Soft shadows off. 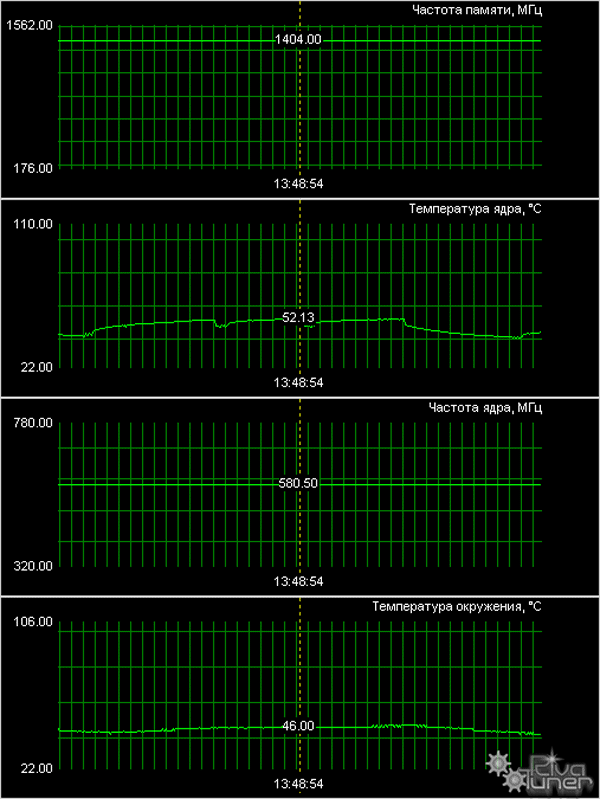 Note that we conducted two tests: of a single card and in SLI mode. Gaming tests with heavy load on vertex shader units; mixed load on pixel shader units 1.1 and 2.0; active multitexturing. Gaming tests with heavy load on vertex shader units, pixel shader units 2.0; active multitexturing. It's all good with X1950 PRO. In this game the novelty is obviously victorious. But in this game, vice versa, AA+AF is rather comfortable even on mid-end cards. Therefore X1950 PRO slightly lost, in general. When 99% of load falls upon shader calculations, the novelty wins unconditionally due to its rather large amount of pixel shader units. 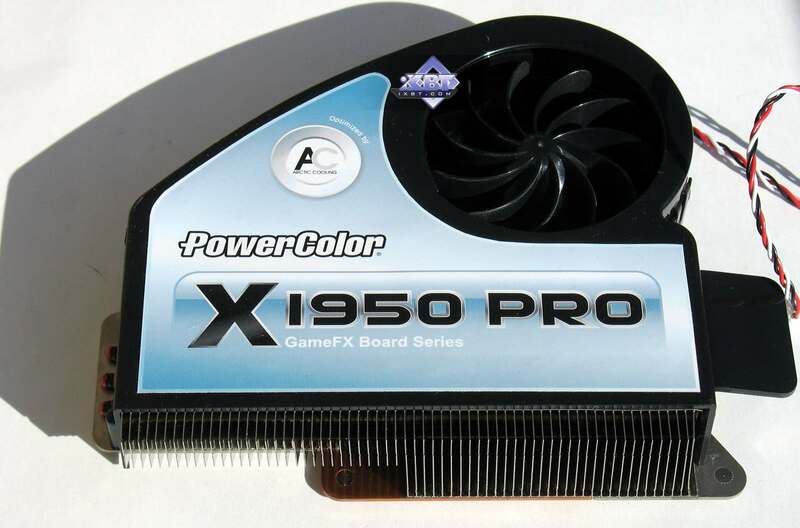 Here the load is mixed with complex texturing, so X1950 PRO winning percent is lower. And in this case the load on shader units grew again, so the novelty won. Especially considering that its rival doesn't support HDR+AA. 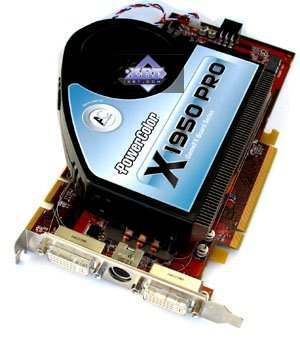 ATI RADEON X1950 PRO 256MB PCI-E (RV570) (PowerColor) is a very good, even an excellent product! For its price it justifies everything and add VIVO as a bonus. Of course, initial prices will exceed $200, but GeForce 7900 GS wasn't initially sold for these money as well. In other words, it's best choice for this price tag. Other characteristics, including stability and 2D quality, are all excellent. For more card comparisons see our 3Digest.